Moshie Safdie speaks to an audience at JUMP in Boise last month. Photo by Brian Myrick, courtesy Idaho Press. 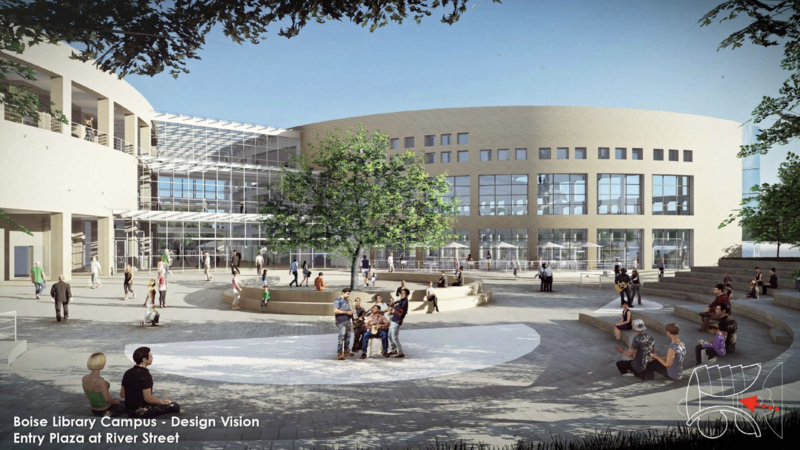 The City of Boise hopes to build a dazzling new library campus near the Boise River, and hired an architect it heralds as visionary. That vision is coming at a significant cost to taxpayers, with first-class travel and stays at a top hotel – including some expenses above and beyond what is contractually allowed. Now after questions from BoiseDev, a portion of that cash will flow back into city coffers. It comes in a city still feeling the long effects of a travel and purchasing scandal that led to considerable reforms on how the city deals with travel – but with enough time passed that none of the city’s elected officials were in office when it happened. 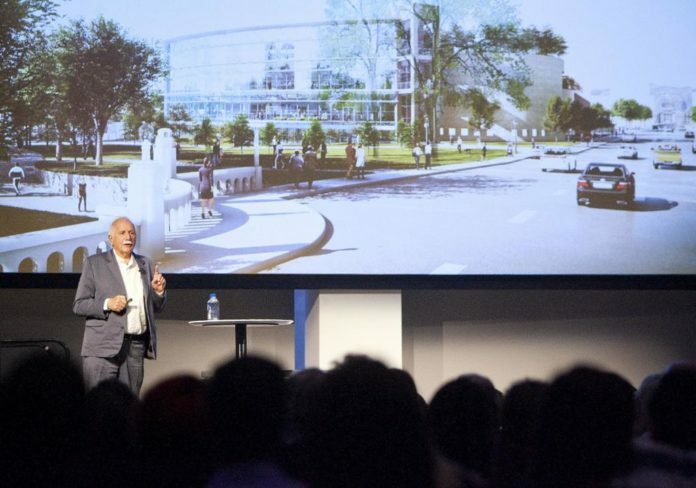 Earlier this year, the city announced a team of Boston-based Safdie Architects and local firm CSHQA won the competitive process to design the new campus. Over the first six months of 2018, the contract cost taxpayers nearly $22,000 for travel and meals according to records requested and reviewed by BoiseDev. This does not include trips after the month of June, including a recent event that brought Moshe Safdie to Boise for a speech and other functions. The contract for design services contains a clause guaranteeing top-level travel for the firm’s principal. 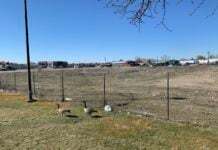 The clause was first reported by Boise Guardian and confirmed through records requests by BoiseDev. The records show Safdie generally, but not always, travels to Idaho on first class plane tickets. City of Boise spokesperson Mike Journee said the contract language was negotiated after Safdie Architects won the competitive bidding process. He said they are not aware of any other contract with similar language now or in the past. 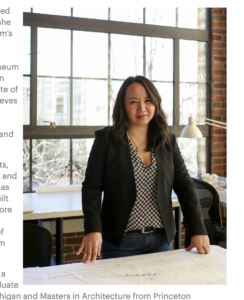 But another member of Safdie’s firm also submitted expense reports with first-class tickets on them that were reimbursed by the City of Boise, something not allowed by the contract. Principal Carrie Yoon came to Boise five times in the period covered by the public records from January through June of this year, including one trip with first class service before the contract was even approved and executed. Yoon travelled from Boston to the City of Trees on January 7th and 8th and labeled her reimbursement form “competition.” The contract was executed more than a month later on February 13th. She flew first class on all four legs of the trip, at a cost of $1,094.50. With meals, ground transportation and hotel – the trip cost $1,485. However, the first class tickets billed to the city for this and other trips for Yoon aren’t allowed, and the city says it will take action. Team members stay almost universally at the Inn at 500 Capitol. The boutique hotel opened in 2017 and is just one of two four-star hotels in the Downtown Boise core. It also has the most expensive average rate for any hotel in Boise according to data provided by TripAdvisor. On average for all members of the team, 15 nights at the hotel have cost $330 per night. The average room rate in Boise for the first eight months of 2018 was just less than $110 per night according to data provided by the Greater Boise Auditorium District. Safdie’s expense report notes that a Boston to Boise flight was canceled. This prompted a new ticket issued at the last minute for $1,371. The new fare replaced a business class trip with a ticket that was first class on the first leg and economy class from Minneapolis to Boise. Hotel nights for Yoon, Safdie, Kinzel and Reaves at Inn at 500 Capitol – $2,605. 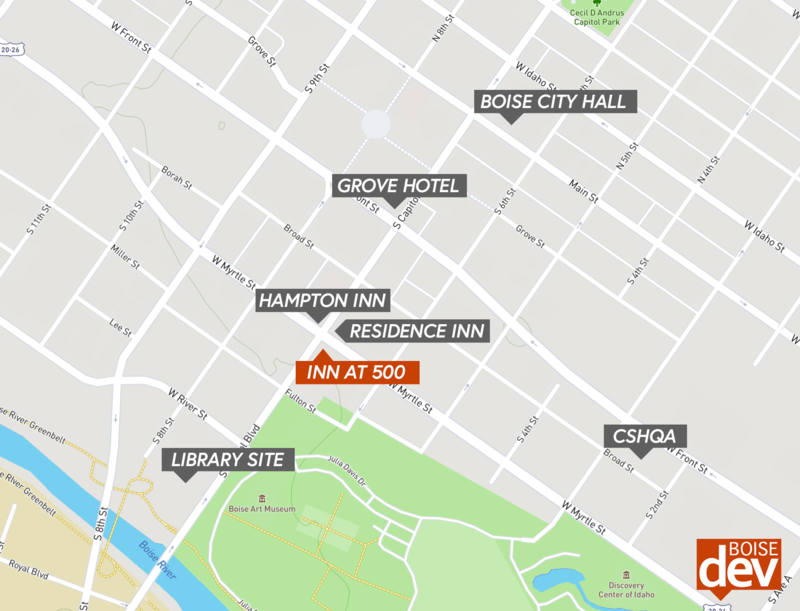 With the exception of two nights by Tessman spent at the Modern Hotel, all accommodations in Boise were at the Inn at 500. A later trip by Tessman included a stay at Inn at 500. City of Boise Public Works Assistant Facilities Program Manager Shawn Wilson said that particular hotel has a favorable location. “It’s kind of the location – the consultants like to locate centrally – it’s close to the library, it’s close to city hall and it’s close to CSHQA,” he said. Two other hotels stand on the same corner – the Hampton Inn and Suites and the Residence Inn by Marriott. The Grove Hotel is about two blocks away. City spokesperson Mike Journee says the city was aware team members were staying at the Inn at 500 Capitol. In a follow-up email, Journee said the Inn at 500’s in-house restaurant is a key feature. Expense reports do show charges for room service from Richard’s, and at least one meal in the restaurant itself. The Grove and new Residence Inn also both offer in-house restaurants. The Hampton Inn provides breakfast service and adjoins the Bodo development with several restaurant properties, though it does not have a full-service restaurant. Journee said the Safdie team travels extensively for its projects, which is why the city agreed to the higher-level travel. While this situation is markedly different, Boise has a tangled history with the use of public funds for travel. In the winter of 2002-2003, a series of trips, Broadway plays and expensive dinners were uncovered by the media and investigators with the Idaho Attorney General’s office. At the end, Boise Mayor Brent Coles resigned and went to jail, his chief of staff landed in prison, and several other staffers including the police chief resigned or were forced out. In the wake, Dave Bieter was elected mayor after an election campaign that centered on ethics. He and Carolyn Terteling-Pane who served as interim mayor after Coles resigned, as well as city council members put in a number of controls on city spending – particularly travel. All requests for travel by city employees go before Boise City Council for approval. 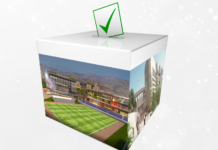 The requests for travel by members of the Safdie team were not approved by council outside of their vote on the final contract with the firm, according to Journee. Correction: An earlier version of this piece misspelled Moshe Safdie’s first name. Great reporting, Don. Meanwhile state employees traveling for work are nickel and dimed with very strict rules. This is a fascinating topic on several levels, well beyond the new library topic. As a lover of all things related to books, libraries being at the top of that list, I like the concept that is being presented for our new library. As to the process and system for bringing this to fruition I have some concerns. A contract is an agreement that ostensibly both sides have negotiated and agreed upon. The City’s experts, City Attorney’s office, should look at that closely to ensure it complies with ethics laws in this regard. It sounds like Mr Safire and his team are top notch, but I find myself conflicted in how we seem to be courting him like we, the City, is a young suitor hoping to snare the pretty girl, rather than a carefully weighed business relationship. The big dinners and hotel, yeah. Maybe worth a little critique. The airfare though? Just over $1,000 for first class from Boston to Boise? That’s a steal. The fawning by our city over Safdie is disgusting. He’s an architect. Arguably a good one, although his regurgitation of the SLC library facing the wrong way and completely ignoring the river makes me less convinced of that. That said, I don’t have a problem with the first class or nice hotels. If Safdie’s proposal (including value) was better than others, then that’s fine. What is unbelievable to me is that the city reimbursed expenses incurred before the contract was awarded. That cannot be included in the SOW and therefore must be illegal. The fact that this payment was to provide an opportunity for one competitor to get a leg up before the award decision means that whoever approved it needs to go to jail. That’s straight up criminal and the whole contract needs to be invalidated. Retaining top talent costs money folks! I’ve no doubt every single person that reads this would expect to be highly compensated as well for any travel time and would fully expect per diem when crossing two time zones for a project, much less if you were an in demand professional. Library? Do Americans even read books anymore? The proposed building is a hideous architectural abomination that belongs on James Howard Kunstler’s Eyesore of the Month page. I think they could have easily hired a local firm to design an equally ugly building. Sadly we know that taxpayers are treated as sheep and fleeced regularly. Shame on the city council, and any city attorney who reviewed and signed off on this contract. No one involved here was a good and prudent steward of the taxpayers money.